Married in 1970, David and his wife, Sally, have enjoyed 48 years of celebrating the Miracle of Love in marriage. They have three children and seven grandchildren. An ordained Valentinian Gnostic Priest, David now offers a broader ministry. He feels this is a continuation of Christ's teaching embracing all faiths and spiritual belief systems, which permit him to conduct many types of ceremonies - modern or traditional, spiritual or non religious and Celtic Handfastings. Many people think David is a Druid, Shaman or Wiccan. He simply recognises divinity in all belief systems. With many, many year’s experience, David creates and performs special ceremonies for people who, for whatever reason, choose to come to him. He does not see them as opportunities to push religion or evangelise but, rather, to meet people where they are at and enable them to express what they need to. He really enjoys being close to nature, whether by the water, amongst the mountains or in a forest. He is most content with the horizon as his walls, the stars his roof and the earth his floor. His philosophy - we are all part of nature and can find spirituality in all aspects of nature, in the weather, flowers, trees and in animals. "Thank you so much for being our celebrant. We had the best day of our lives and the ceremony was exactly what we wanted. Our guests are still talking about how personal and creative it was. You put us at ease when we first met you and we knew the ceremony would be great and it certainly surpassed our expectations". Jackie & Toby, Bedford. In his spare time David enjoys acting and appears on film and TV shows. 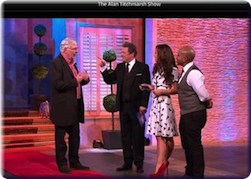 The photo here is David with Alan Titchmarsh and Myleene Klaas on ITV's 'The Alan Titchmarsh Show'. His last film was a 2 day shoot, on location in Luton. The film is called 'Off the Aisle' and is about a wedding that goes wrong - but there is a twist at the end. David appeared in episodes 4, 5 & 6. In the photograph on the left, David is wearing the cloth cap. This was a funeral scene with Dame Maggie & Penelope Wilton. You may see him as an 'extra' in TV commercials and the occasional 'walk on' role in TV programmes. 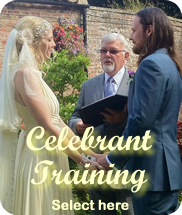 David is an experienced and versatile Celebrant, who is more than capable of hand crafting the type of ceremony that you are looking for. Whether religious or not, you can be assured the ceremony will be 'spiritual' in its own way for you. Your ceremony will reflect all you wish to say. David will be pleased for this to take place in a building or outdoors – maybe in a forest, on a beach, in a garden .. wherever you choose. 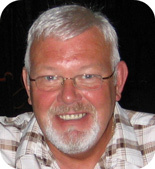 * David was a committee member of The Association Of Independent Celebrants . Allow David the privilege of being your celebrant. Allow David to help make your day so VERY Special. Kay and I have never been very traditional. We come from different backgrounds, which complicated the nature of the ceremony. My beautiful, resourceful wife found David. He has performed a wonderfully diverse number of ceremonies, demonstrating to us, his flexibility. When we met him, whatever cynicism and/or reservations I had remaining had been extinguished. His voice and mannerism are so gentle. He's extremely professional, yet grandfatherly and warm. He was wonderfully professional and flexible. He was very encouraging, and happy to contribute ideas you couldn't possibly conceive of rejecting.